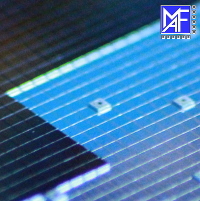 In the second process step, the wafer is sawed with high-precision. Chips are subsequently separated from one another and can be further processed. Wafer maps can also be processed by us. The separated chips are picked up from the foil by a handling system and inserted into a waffle-pack. In this regard, please also consider our delivery times. 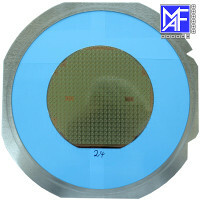 Backgrinding of wafers is performed by our partners. On request chips can be packed in provided gel-packs.